The Moon originated at the same time as the Earth, being formed substantially from the same material, aggregating and solidifying. The Moon was formed not in the vicinity of the Earth, but in a different part of the solar system, and was later captured by the Earth. The Moon was originally a portion of the terrestrial crust and was blasted into space by an ancient impact, where it coalesced into its present form and its orbit evolved to its current form. The above hypotheses really concern the problem of how the Moon came to be in its current orbit around the Earth. This is not the same as the actual origin of the Moon. As suggested in Firmament and Chaos, terrestrial bodies did not accrete from cold particles of refractory material (dust or gravel) in the inner solar system as currently believed. I maintain that all terrestrial-type bodies, including the Moon, originated as a result of highly energetic impacts on the giant planets, Jupiter, Saturn, Uranus or Neptune, which comprised the original solar system. The giants are made up of clathrates or gas hydrates, primarily water molecules, which encapsulate all the elements in the periodic table. Each terrestrial body, including the Moon, condensed rapidly from a cloud of hot plasma that rebounded from such impacts. That is why the outer layer of the Moon comprises anorthosite, the least dense mafic rock that would have come to the surface of the very hot proto-Moon, via a process called plagioclase flotation. The process is explained in great detail in the section on Venus on this website, since its birth 6000 years ago is clearly described in ancient myth. Only three terrestrial planets have formed in this way, priori-Mars, Earth, and Venus, in the order of their creation. Mercury is the former solid core of priori-Mars, which separated some 2,700 years ago and Mars is its collapsed outer shell. Since the Moon is considerably less massive than these planets, it may have resulted from a less energetic impact or formed at the same time as one of the terrestrial planets. One possibility is that it formed as a result of the same impact on Saturn which formed its rings and satellites. Rings form from material which was ejected inside the Roche limit of the giant planet, and was not able to accrete into a sizeable satellite. At some future date the origins of all the terrestrial bodies may be determined by comparing their complete chemical composition with those of the four giant planets. In spite of the ‘lunar rocks’ that were picked up and returned by the Apollo astronauts and the unmanned Soviet Luna vehicles, the age of the Moon is unknown. 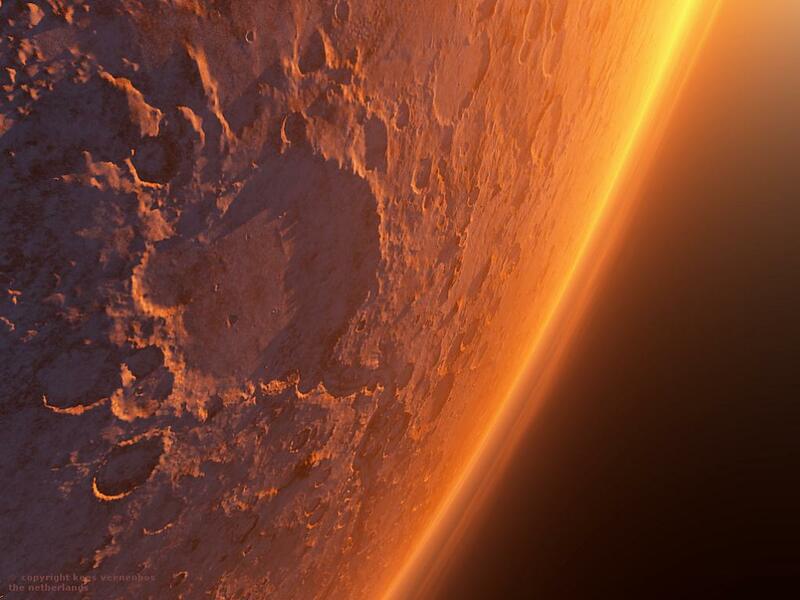 The regolith that covers its near side to a depth of some two kilometers, was ejected as many vast clouds of rock and dust from convulsions within priori-Mars during the Vedic period (6000 to 2700 years BP) and comprises mostly Martian rocks. Thus, although there may be some true lunar rocks among the samples returned, we do not know which ones they are. The only way to determine the true age of the Moon will be for astronauts to land on the far side, which is free of the regolith covering, and chip off true bedrock. The three theories of lunar formation cited above are based on the notion that the Moon has been in orbit around the Earth for billions of years. This assumption is without basis if the Moon was captured. The Egyptian mythical name for the Moon, Isismeans 'ancient,' implying some knowledge of the date of its acquisition, within their cultural memory. Immanuel Velikovsky published an article specifically on the Moon, considering particularly its acquisition age. He cites references to eight sages whose writings implied that the Moon was captured by the Earth in proto-historical times, within the ‘memory’ of the most ancient cultures. He lists references to the writings of Aristotle, Apollonius of Rhodes, Plutarch, Ovid, Hippolytus, Lucian and Censorinus. The period when the Earth was Moonless is probably the most remote recollection of mankind. Democritus and Anaxagoras taught that there was a time when the Earth was without the Moon ... Arcadia in Greece, before being inhabited by the Hellenes, had a population of Pelasgians, and that these aborigines occupied the land already before there was a moon in the sky above the Earth; for this reason they were called Proselenes. Some allusions to the time before there was a Moon may be found also in the Scriptures. In Job 25:5 the grandeur of the Lord who "Makes peace in the heights" is praised and the time is mentioned "before [there was] a moon and it did not shine." Also in Psalm 72:5 it is said: "Thou wast feared since [the time of] the sun and before [the time of] the moon, a generation of generations." A "generation of generations" means a very long time. The memory of a world without a moon lives in oral tradition among the Indians. The Indians of the Bogota highlands in the eastern Cordilleras of Colombia relate some of their tribal reminiscences to the time before there was a moon. "In the earliest times, when the moon was not yet in the heavens," say the tribesmen of Chibchas. Since mankind on both sides of the Atlantic preserved the memory of a time when the Earth was without the Moon, the first hypothesis, namely, of the Moon originating simultaneously with the Earth and in its vicinity, is to be excluded, leaving the other two hypotheses to compete between themselves. We have seen that the traditions of diverse peoples offer corroborative testimony to the effect that in a very early age, but still in the memory of mankind, no moon accompanied the Earth. Since human beings already peopled the Earth, it is improbable that the Moon sprang from it: there must have existed a solid lithosphere, not a liquid earth. Thus while I do not claim to know the origin of the Moon, I find it more probable that the Moon was captured by the Earth. Such an event would have occurred as a catastrophe. If the Moon’s formation took place away from the Earth, its composition may be quite different. Since the time the Moon began to accompany the Earth, it underwent the influence of contacts with comets and planets that passed near the Earth in subsequent ages. The mass of the Moon being less than that of the Earth, the Moon must have suffered greater disturbances in cosmic contacts. During these contacts the Moon was not carried away: this is due to the fact that no body more powerful than the Earth came sufficiently close to the Moon to take it away from the Earth for good; but in the contacts that took place the Moon was removed repeatedly from one orbit to another. The variations in the position of the Moon can be read in the variations in the length of the month. [Ancient calendars reveal that] The length of the month repeatedly changed in subsequent catastrophic events—and for this there exists a large amount of supporting evidence. In Firmament, Chaos and Peleh: Hidden Knowledge I accept Velikovsky’s premise that the Moon was captured in orbit around the Earth within proto-historical times, moreover I explain the physical mechanism which made this possible. This process, which I maintain took place at the date of the Younger Dryas, was catastrophic, triggering global earthquakes, erupting volcanos and tidal flooding across entire continents. Astrodynamicists claim that such a capture has to involve a third body, in order to conserve kinetic energy and angular momentum, but this view is based on the assumption that the bodies are rigid and solid throughout. As explained in my books, the spin axis of the mantle was reoriented by 180 degrees twice at the dates of the Younger Dryas. This makes it clear that the close interaction of two planet-sized bodies involves their internal structure. Using the fact, revealed by seismic studies of the Earth, that the solid core and the lithosphere rotate independently, it becomes obvious that as two planet-sized bodies approach one another, any mass anomalies in the mantle, such as the Tibetan-Himalayan complex, could cause it to experience torques which could result in the reorienting of its spin axes relative to their solid cores. The energy absorbed by this frictional process makes possible the capture of a body the size of the Moon, without invoking a third body. Professor Emilio Spedicato, of The Universiti Degli Studii Bergamo, in keeping with current astro-dynamics theory, suggests that the Moon could have been captured from a rogue planet (dare I call it planet-X ? ), which passed close to the Earth. Moreover, he suggests that this may have been the same body which impacted Jupiter 5000 years later, resulting in the birth of proto-Venus. Possible evidence for the return of the rogue planet to the vicinity of the Earth after the capture of the Moon and before its impact on Jupiter may lie in the global anomaly which occurred at approximately 8,200 years BP. This can be seen in the Greenland ice core temperature data (below). Geophysical evidence, as well as ancient knowledge, point to the Younger Dryas as the date for the capture of the Moon. I maintain that it was captured into its current orbit at the end of this period, 11.6 cal kyr BP. The Younger Dryas was a short period, geologically speaking, which began at 13,000 years BP, some 1.5 millennia after the end of the last ‘Ice Age.’ This 1300 year drop of 20 degrees F is well documented in the Greenland ice cores (below). It is notable for its rapid onset and an even more rapid conclusion, perhaps as short as a decade. The evidence for great trauma at this time is also available in Antarctic ice cores, ocean and lake sediments and continental flooding, indicating that the event was global in scope. The Greenland ice cores (GISP and GRIP) reveal much more than just the two rapid temperature changes, determined from O18 / O16 ratios, that delineated the Younger Dryas (YD). Mayewski points out prominent instances of increased dustiness, peaking every 500 years before, during and after the YD. He interprets the rise in the atmospheric methane concentration at the end of the YD as proving the event affected low latitude wetlands, because these are thought to be the major source of natural methane. A similar rise in the methane concentration was also measured in the Taylor Dome Antarctic ice core, proving its global significance. An additional abrupt century-long cooling event about 8,200 years BP is also prominent in the Greenland Ice Cores. This was also associated with a rise in the atmospheric methane. The dust spikes noted by Mayewski at intervals of 500 years may have marked other not-so-close perigees of the Moon, each of which reduced its apogee as part of the capture process. Using Optically Stimulated Luminescence, Hanson, reports on the ages of colluvial aprons from the Laramie River and Sybille Creek in Wyoming, which are deposited on flood plains, arroyo bottoms and adjacent terraces, He found that these hillsides were denuded both at the transition into and out of the YD. The evidence is consistent with my hypothesis that the YD events were caused by the close approach to the Earth of a large body such as the Moon or planet-X. As suggested in Firmament, the two encounters that delineate the YD were actual overturnings of the lithosphere of the Earth, without a significant slowing of its rotation rate. These encounters caused enormous tidal floods, in which oceans were pulled from their basins and rushed across entire continents. This explains the fact that the most abrupt rise in methane occurred at the beginning of the YD. This was released from the methane clathrates known to accumulate beneath the sea, when these waters were pulled from their beds. These can only exist under the high pressure created by the weight of the oceans. When the pressure was released, the clathrates nearest the surface broke down, releasing their stores of methane. The scenario of tidal flooding is consistent with the ubiquitous devastation of fauna evidenced by buried caches of millions of broken animal bones found in completely different parts of the world, as reported by Velikovsky and DeGrazia, with extinct and extant animals intermixed. These were slaughtered by great rocks tumbling ahead of the tidal waves as they crossed the continents and were collected in lowland eddies and immediately covered by silt, preventing their oxidation. Indeed, the oils from these animals may have seeped into the Earth until they became trapped by impermeable rock layers, forming a major source of petroleum available today. Many species became extinct at the date of the YD, including the Wooly Mammoth in Siberia and the Saber-Toothed Tiger in North America. But the ice cores record more than just the changes that occurred at times of these traumatic events. They show the entire history of the world climate before (the ice ages and the pre-boreal) and after (the Holocene) these events. They reveal that the YD marks the onset of a completely different climatic regime on the earth, called the Holocene. In other words this record actually shows the immediate climatic effect of the stabilization of the Earth by the presence of the newly captured Moon. Many geophysicists, in keeping with their uniformitarian paradigm, suggest that the current warm period is merely another ‘interstadial,’ the name given to the warm period between the ice ages. They claim that ‘ice ages’ will continue to plague the Earth in the future. I suggest that the stabilization of the Earth by the capture of the Moon was the first of several steps leading to its preparation for the growth and prospering of mankind. The scripture quoted above by Velikovsky in Job 25:5, "the grandeur of the Lord who ‘makes peace in the heights’" may indeed be a reference to the stabilizing effect of the Moon on the Earth. In spite of the evidence, scientists have no idea of the momentous events that marked the beginning and end of the Younger Dryas. On both occasions the lithosphere of the Earth was completely overturned, just as it was later due to two close approaches of proto-Venus. For 1300 years the Sun rose in the west and set in the east. Corroboration of the overturning of the Earth at the date of the Younger Dryas transitions is found in the cultural memory of the Egyptians, as related to Solon the Greek around 475 B.C. They stated that their kingdom was 341 generations old. Assuming thirty-seven years per generation, their cultural memory could have extended back to the time of the Younger Dryas. Moreover, the priests also told him that in the entire memory of their people, the Earth had overturned four times. Velikovsky cites a number of other cultures which ‘remembered’ four ‘suns,‘ages’ or ‘skys,’ - each of which were terminated by catastrophic cosmic events. The two later overturnings of the Earth were the result of close passes of proto-Venus around 6,000 years BP. The orbital parameters of the Moon established at the date of the YD transition to the Holocene, were not exactly the same as their current values. Due to the one hundred captures and releases of priori-Mars and the approaches of proto-Venus every thirty years during these encounters, the period of the Moon has varied somewhat. The changes are reflected in the differing lengths of the month recorded in the calendars of many ancient cultures, from as long as thirty-six to as few as twenty-seven days. Computer simulations reveal that the orbit of the Moon was ‘scalloped’ when priori-Mars was in geosynchronous orbit at a center-to-center distance of 44,000 km. 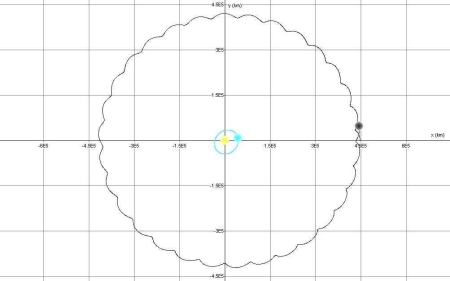 An orbit from one of these simulations is shown above. The Moon’s rotation (spin) period, which now is identical to its orbital period was probably different at the conclusion of the Younger Dryas because at that time its center of gravity was not offset. The rotation was probably brought into exact coincidence with its orbital period within the last 6,000 years due to the deposition of a two kilometer thick layer of regolith on the near side. Its spin-orbit synchronization is now ensured because the regolith has offset its center-of-gravity approximately some two kilometers from its geometrical center, in the direction of the Earth. This material was all ejected from priori-Mars during the dance encounters and fell onto the surface of the Moon in the last 6,000 years. Most of the regolith is currently believed to be rock of lunar origin that has become pulverized by the influx of innumerable micrometeorites over the last 4.5 billion years. I maintain that most of the regolith is from priori-Mars, blasted to the Moon in great clouds of rock and dust, in the last 6,000 years. This material was propelled by enormous convulsions in the interior of priori-Mars’ when it rapidly passed through alignments with the Earth, Moon and Sun. These dangerous eruptions killed many people on Earth and were the reason for the ancients great concern about predicting eclipses. Innumerable particles fell to the Moon in vast storms, falling on similar material already emplaced caused highly localized melting and the sticking together of tiny particles, forming the most common rock type found in the regolith, breccias. The maria are currently thought to be lava flows from the interior of the Moon. There are several problems with this hypothesis. The most obvious one is that the ‘lava flows’ are only present on the near side of the Moon, more specifically, only in basins formed by impacts on the near side. Moreover the calculated ages of the rocks in different maria are between three and eight hundred million years younger than the basin ejecta. This is currently interpreted as meaning that the subsurface rock, deep in the interior, melted and flowed exclusively into the maria basins at different intervals of the order of hundreds of millions of years after the giant impacts that formed the basins. A third problem, that is rarely stated, is that the maria are not filled with lava. Quoting from Fred Hoyle (The Cosmogony of the Solar System). This picture would essentially have been proven if visits to the lunar maria had revealed the presence of extensive lava beds. But no astronaut has ever stood upon a lava bed. It is commonly stated that lava flows have been found on the Moon, but such statements are incorrect. Lava flows have been found only in the imagination of those who have examined distant photographs taken from [of?] the Apollo landing sites. What astronauts actually found was a great deal of fine powder. Embedded or lying on the powdery surface was a multitude of rock fragments. Subsequent chemical analyses of the rock fragments showed them to be of highly variable chemical composition, making it quite unlikely that they were fragments from a single coherent flow of molten rock. Rather they seem to be ejecta from impact events that occur over a wide areas of the Moon’s surface." I maintain that the maria formed when a series of large hot bodies were ejected, rapid fire, from the same volcanic vent on priori-Mars, as it orbited the Earth. This stream of glowing bodies had barely sufficient velocities to reach the Moons orbit and therefore impacted the lunar surface at less than escape velocity. 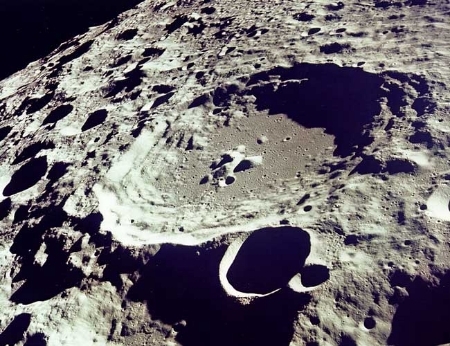 Researchers from the Fermi Institute and the University of Chicago, who have calculated the impact velocities for a dozen large impact basins, conclude that they are very low, indeed, six of them fall below the escape velocity (2.4 kilometers per second) of the Moon. Although there are a number of assumptions in their method, they conclude that most of the basin forming impacts had systematically low impact velocities. The currently accepted theory cannot offer any explanation as to why there should be such low impact velocities. I maintain that these bodies were still hot when they impacted on the Moon. Their impacts were cushioned by the thick unconsolidated layer of regolith (dust and small rocks) already in place from millennia of earlier ejections from priori-Mars. The heat of their impacts was sufficient to allow the already softened bodies to break into small rocks which remained in the basins formed by the impacts. Thus the maria do not contain true lava flows, instead the differences of the rocks that made up the impacting bodies are preserved in the basins. The currently accepted notion that the basin depths and the rupturing of rock beneath them allowed lava to flow up into them exclusively, hundreds of millions of years later, is negated by the simple fact that a number of smaller craters, due to the impact of secondaries, which broke away from the main maria impactors, also contain the dark maria material as shown above. The maria basins exhibit strong gravitational anomalies - so large that they can produce considerable errors in orbital predictions. The fact that these deposits have not reached isostatic equilibrium is strong evidence against their being due to lava flows from the interior of the Moon. It implies that the lunar crust was already sufficiently cool and rigid enough to support the impacted masses. Some of the western maria also exhibit gamma ray spectra of potassium and Rare Earth Elements and Phosporous, which are quite ‘foreign’ to the Moon. These KREEP rocks are too dense to have floated to the surface of the Moon when it was molten, and therefore must have been part of the impacting bodies. An ancient Egyptian myth clearly describes the formation of the maria. It tells that Set cut up the body of his enemy, the god Osiris, into fourteen pieces and spread them all around so that he could not be resurrected. But Osiris’ faithful lover, Isis (the Moon) went around and searched until she found every one. At each place she found one she placed a monument. I maintain that Osiris was the enormous hardened lava column that formed at the north pole of priori-Mars during its prolonged encounters with the Earth. It was the primary deity of every culture on Earth during the Vedic or Olympian period. (See the section on priori-Mars). When periodic convulsions shook the planet this massive body collapsed, as large hot bodies were ejected from the same volcanic vents from which it originated. This was interpreted as the death of Osiris, but the figure reformed after each collapse. On one such occasion a sequence of fourteen large hot bodies were shot in a stream from the same vent in rapid succession, which just had sufficient velocity to reach the orbit of the Moon, where they impacted one after another. Those bodies not only formed the maria, but, softened by their hot origin, each from deeper inside priori-mars than the previous one, they broke into myriads of small mafic rocks and remained in the basins created by their impacts. Formation of 14 young large basins, >300 km in diameter, that are sharply circular, have many characteristic basin features clearly delineated, and have both positive and negative mass concentrations (mascons) associated with them. Measured and inferred ages for these events range from 3.92 (Nectaris) to 3.8 b.y. (Orientalis). Thus, close study of the lunar surface has identified the fourteen basins formed by the bodies in the Egyptian myth. The calculated ages and compositional differences of the rocks in these maria are due to the different depths within priori-Mars from which the rocks originated. The hotter ones, from greater depths, lost more of the argon gas used for age calculation, by diffusion, and thus appear younger. The age of their origin within priori-Mars forms an upper limit and can be determined from the same rocks exhibiting ‘fossil magnetism’ found in the regolith. These were near surface rocks formed in the magnetic field of priori-Mars, which were not heated enough to lose their magnetism or their age determining elements. The offset center of gravity, the regolith, the low velocity of maria impacts, the lack of true lava flows, the fossil magnetism of many rocks, the differing ages calculated for the maria, are naught but smoke and mirrors. This is the Trickster at work, who is preparing to show the folly of the scientists who say that science has replaced God.